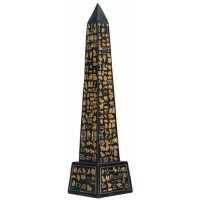 Standing 10 inches tall, this Obelisk is modeled after Ancient Egyptian monuments covered in hieroglyphics. 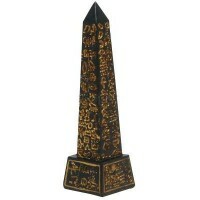 Cold cast resin with an antique gold color, this Egyptian obelisk is 10 inches tall. 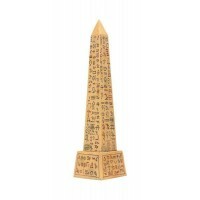 Obelisks in Ancient Egypt were used to commemorate events or Pharoah and thought to represent a ray of the sun. Covered in heiroglyphics, it has the twin cobras of Upper and Lower Egypt on the base. Item Number: PT-10294 | Approximate Size (Inches): 3.00 wide x 3.00 deep x 10.00 high | Approximate Shipping Weight: 2.00 lbs.